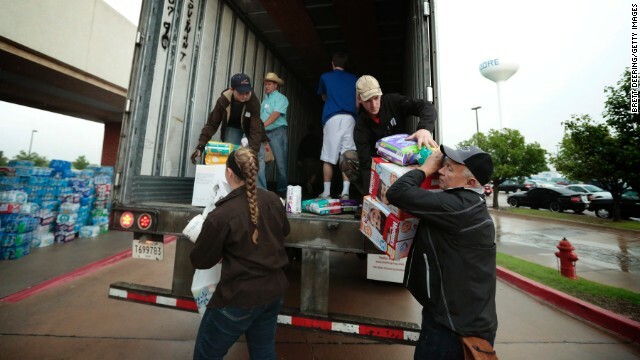 Volunteers unload donations for tornado victims at the First Baptist Church on May 23, 2013 in Moore, Oklahoma. (CNN) - For six days, First Baptist Church in Moore, Oklahoma, provided food and shelter to victims of Monday’s deadly tornado. On the seventh day, the church offers another scarce resource: solace. Four of the nine children who died in Monday’s tornado had ties to First Baptist. On Sunday evening, the church will host a prayer service called “Oklahoma Strong: Coming Together in Faith,” which Gov. Mary Fallin is expected to attend. In all, 24 people perished as a result of Monday’s tornado. Nearly 400 suffered broken bones and bruises, and 1,200 homes in Moore and Oklahoma City were damaged or destroyed, according to state officials. The twister’s tenacity took even Tornado Alley by surprise. But as cleanup begins, imams, pastors and rabbis in the deeply religious Sooner State are encouraging believers to draw on the deep wells of their traditions for spiritual sustenance. The common message across the faiths seems to be: God’s voice was not in Monday’s whirlwind but rather in the steady, quiet aftermath of neighbor helping neighbor. Like Harris, Abdur-Rahman Taleb, the director of youth services at the Islamic Society of Greater Oklahoma City, focused on the human response to Monday’s tornado. Passing that test entails remaining patient amid calamity, the Quran says. “We want to be mindful of God day in and day out, whether we’re going through good times or bad,” Taleb said. At Journey Church, an evangelical megachurch about 10 miles from Moore, Sunday’s message is about rebuilding, said Pastor Sam Wampler. The congregation will look to Nehemiah, who restored the walls of Jerusalem, for inspiration, said the pastor. Pastor Bobby Gruenewald of LifeChurch.tv, which has 11 branches in Oklahoma, said his message on Sunday will focus on two key questions: Where is God during tragedies? And what can Christians do to help? 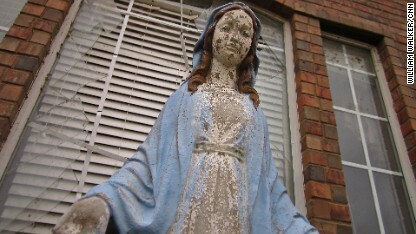 A garden statue of the Virgin Mary stands in front of a window shattered by the tornado in Moore, Oklahoma. Some of the tornado’s first-responders have been turning to the Rev. Thomas Boyer, the longtime pastor at St. Mark the Evangelist Catholic Church in nearby Norman, Oklahoma. Boyer said he’s still searching for the right words to say in response. “Normally my homily is done on Thursday and posted on the website, but it's not even done," the priest said on Friday afternoon, as day darkened into night. Boyer will have some help: the Archdiocese of Oklahoma City adjusted the prayers and petitions for Sunday Mass to address the area's tribulations. But sometimes there is nothing to say other than “look to the Lord,” said Clarkson, who has already presided at the funerals of three young tornado victims. Perhaps that’s why Jared Bowie’s photo of a dark tornado twisting toward a cross has gone viral. Bowie, an intern at LifeChurch.tv’s campus in Edmond, Oklahoma, said his image has graced thousands of blog posts, media reports, Facebook pages and Instagram accounts since he posted it to CNN’s iReport. One woman even printed out the image and hung it next to her wedding photo, Bowie said. The picture was taken on May 19, when another tornado, a less destructive forebear of Monday’s deadly whirlwind, churned through Oklahoma. Nonetheless, the image has become inextricably tied to Moore’s loss of lives and homes, and the ultimate source of salvation for Bowie and other Christians. Eric Marrapodi, Dan Merica and Jessica Ravitz contributed to this report. Hiya very cool web site!! Guy .. Beautiful .. Superb .. I will bookmark your blog and take the feeds also…I am satisfied to find a lot of useful information right here within the put up, we want develop more strategies on this regard, thanks for sharing. . . . . . Please god,stop killing so many of us. How many times are you going to post this garbage. This has been disputed, and you've been proven wrong. Stop posting this crap. Y DOESN'T dorothy murdock post on this dump? i think she has a thing 4 lil fatso sambo, the big girl wanna b. ms. delight. ms sunshine. You tell me, you stupid c u n t. You don't posess any. 1-all your kids are to die. 2-You'll be beaten to death. Normally and logically all of you will choose the second one. Why that choice? Because dying for one time is better than dying every day. Those who lost their kids are dying every day to the rest of their life. Also Those who are sick with dangerous diseases are dying every day. Those who lost their wives or husbands or beloveds are dying every day. And too many others are suffering and dying every hour because of the pain of the soul not the body. Actually the suffering body is nothing comparing with the suffering soul. Actually That concept destroying your faith from the base……………how? We can ask for how many hours the Christ suffered? Two hours? three hours? ten hours? Actually If he was sick for many years, or if he lost his family or if he lost much of his beloveds and dears or if he passed all these things then we can say that he suffered for the human kind. But suffering by beaten for few hours for all the human kind for all the time a little child can not believe it. That is why you can find too much atheists in your sociaty because what they found in Christianity is against the logic and the brain. If the forgiveness is by beaten, then what a cheap price for forgiveness.